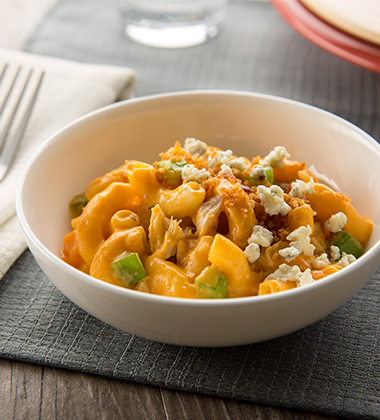 Buffalo Mac & Cheese made by combining Campbells® Macaroni and Cheese and Campbell's® Signature Buffalo Style Chicken with Blue Cheese Soup and topped with blue cheese crumbles. 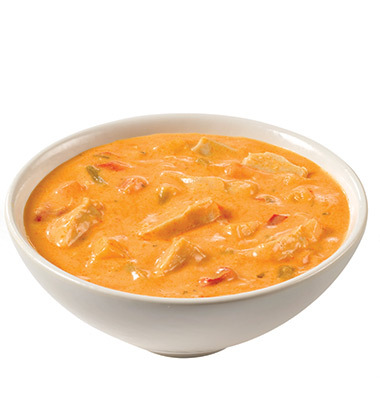 A creamy chicken soup made with tender vegetables and blue cheese finished with a dash of hot sauce. 1. Thaw Campbells® Signature Macaroni and Cheese and Campbell's® Signature Buffalo Style Chicken with Blue Cheese Soup according to package directions. Reserve. crushed red pepper, flakes	 2 tbsp. hot pepper sauce	 0 oz. 1 tsp. 2. Spray oven-proof casserole with non-stick cooking spray. Reserve. 2. 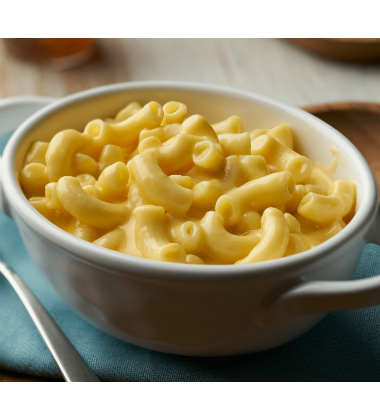 In large bowl, mix together thawed macaroni and soup. 3. Add chicken, celery, red pepper flakes, hot sauce, blue cheese and first listed panko. Stir until combined. Place in a greased oven-proof casserole dish. Reserve. butter, melted	 2 oz. 5 tbsp. 1. In medium bowl, toss second listed panko with melted butter. 2. Evenly sprinkle over top of filled casserole dish. Bake for 30 minutes, or until golden brown. green onion, chopped	 2 tsp. 2. Garnish with 1-1/2 teaspoons blue cheese crumbles and a pinch of green onion. Serve immediately. crushed red pepper	 2 tbsp. hot pepper sauce	 0.25 oz. 1 tsp. butter	 2.4 oz. 5 tbsp.